One of the qualities of an image that can set it apart from others is its ability to interpret a subject. It's always great to view a properly exposed and well-composed photograph. But some photographs also reveal something about their subject matter that causes the viewer to think differently as a result of interacting with the photograph. And that a very good thing. Knowledge of Your Subject: You must understand your subject to interpret it. What ever you're shooting, the more you know about the subject the more expressive you can be as you portray ideas in your image. Knowledge of Yourself: You must understand what's going on in you as you view your subject before you trip the shutter. What is it that attracts to you to your subject? What is it causing you to feel? What do you want the viewer to get from the experience of viewing the photograph? Connect the Two Photographically: You need to be able to put these understandings into the composition of your image. The viewer can then see what you loved about the subject and feel what moved you as you took the photo. 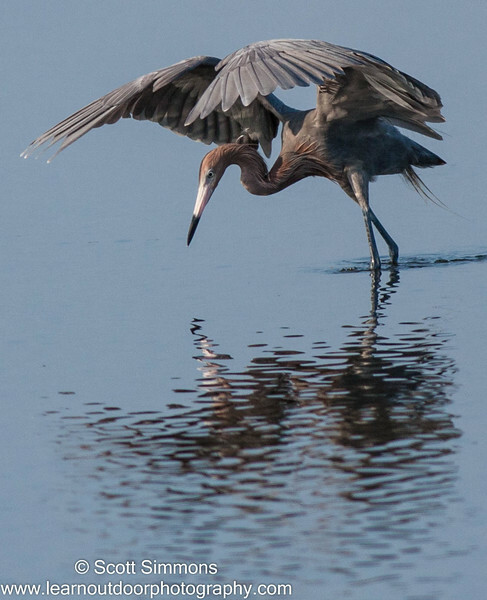 I took the above image of a Reddish Egret when I was at Merritt Island NWR. One of their distinctive behaviors is to run as they're feeding and spread their wings as they thrust their beaks in the water to catch their prey. They spread their wings to cut down on the glare from the sun so that they can see their prey in the water more easily. It's one of the behaviors that can help identify the species, and for me, it's one of the attractive features of the bird's behavior. As I was shooting this particular bird, the lighting was just right to capture both the bird and its reflection. I wanted a photo of him (and his reflection) spreading his wings as he was feeding; for me, the reflection would help the viewer understand why the bird behaves the way it does. It strikes me that the same method is used in the interpretation and application of scripture: knowledge of your subject (language, customs, historical context, etc. ), knowledge of yourself (what is going on in your life today), and connecting the two. Yes, I suppose you could say that all knowledge is somewhat that way--that is, knowing about a subject without self knowledge or the ability to connect the two means we do not really have understanding. Nice thought!